In a few months, the strict limits laid down by the Euro 6 exhaust gas standard will become reality. Depending on the kind of vehicle, they demand considerable reductions when it comes to the nitrogen oxide and hydrocarbon emissions as well as soot particles. In order to meet the new limits, the automotive industry is relying on low-pressure exhaust gas recirculation as well as downsizing, a reduction in the engine size through turbocharging with the same or a higher performance. However, with these strategies the traditional levels of loading in the charge-air duct are far exceeded. This is primarily due to the contact with exhaust gas condensate, but also to considerably higher temperatures and pressures. Heat-resistant Ultramid Endure was developed in 2010 especially for these loads. To date, this is the most heat-resistant polyamide (PA) 66-based injection molding material that is available in the market. Now BASF is introducing a blowmolding grade of Ultramid Endure called D5G3 BM and it closes the gap for efficiently manufacturing pipes by blowmolding. In 2012, one of the first serial applications for the injection molding grade Ultramid Endure D3G7 was the substitution of a heat shield in the charge-air duct which had previously been metallic. With its temperature resistance of 220°C in continuous use and peak temperature loads of 240°C, the material can also be used for other components behind the turbocharging such as in the resonator, in sensors and actuators, on the intake side of the intercooler, and in the charge-air manifold. 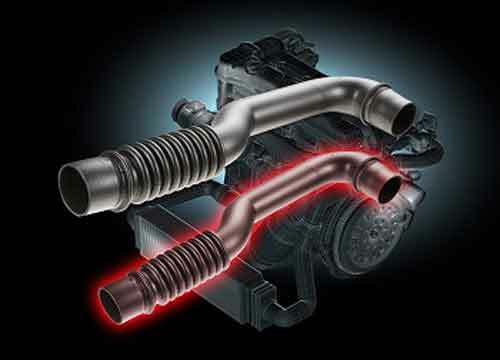 The pipes between the turbocharger and intercooler which are subjected to the same high temperatures can best be manufactured by blowmolding with the new Ultramid Endure grade. The new Ultramid Endure D5G3 BM with a glass fiber content of 15% shows a high heat-aging resistance, is easy to process, and has outstanding acoustic properties. As with the injection molding grade, the temperature resistance is 220°C during continuous use and the possible peak temperature is 240°C. The relatively low melt temperature during processing with blowmolding generally results in favorable system costs. On this account, Ultramid Endure performs significantly better than, for example, polyphenylene sulfide (PPS). Like the injection molding material, the new Endure grade receives its extraordinary heat stabilization from a proven stabilization technology which suppresses the oxidative attack by atmospheric oxygen. The protection is not just confined to the surface, but pervades the whole material. For example, this also allows machining, which might be necessary in the area of connections. The plastic also requires a special melt stability and favorable swelling performance for processing using blowmolding. In the special suction blowmolding process, the molten material is pushed through an annular gap nozzle via a piston in the blow head and threaded into the closed mold. An air current generated by a suction pump and gravity guide the parison through the mold. After the squeezing off of the top and bottom end, the parison is penetrated by a needle and inflated, which ultimately leads to the final shape. A high melt stability counters the change in the length of the parison. The lower this lengthening of the parison, the better suited the product is to suction blowmolding. This applies to the swelling of the parison as well, although a certain level of swelling is necessary because this means that the wall thicknesses can be corrected by low travel paths of the axial wall thickness control. However, excessively high swelling results in problems when introducing the parison into the mold. In addition, materials which swell to a great extent tend to expand as a function of the length of extrusion, which results in the parison having a frusto-conical shape. Ultramid Endure BM, however, remains largely cylindrical. As it also responds well to changes in the processing parameters, corrections are easily possible during the production process. The issue of acoustics has become a brand-relevant factor which plays an important role in the automotive industry. New engine concepts and rising demands from customers and legislation call for materials which are acoustically advantageous. Ultramid Endure shows excellent damping performance. It is therefore also suitable for meeting acoustically demanding requirements. For example, Ultramid Endure can be used to reduce the production of disruptive airborne noise, which is radiated from the vibrating component surface, directly at the source. Depending on the temperature and level of humidity, this material has damping values which are up to 10-times better compared with PPS. The above-average resistance of Ultramid Endure BM to heat aging has been demonstrated impressively in tests. For this purpose, samples were subjected to temperatures of up to 220°C in a climate test cabinet for 3000 hours. The values for the tensile stress at break were only reduced insignificantly and were still considerably above the ones of PPS after 3000 hours. The elongation at break still achieved values of over 2.5% after the same storage time. The material therefore was also significantly tougher than test specimens made from PPS. The first close-to-production components made from Ultramid Endure BM were manufactured at the Dr. Reinold Hagen Foundation in Germany. Following further tests at blowmolding processors, the processing quality of the material was optimized for mass production. The new material is now available in sample quantities and will be ready for commercial use from autumn 2013.